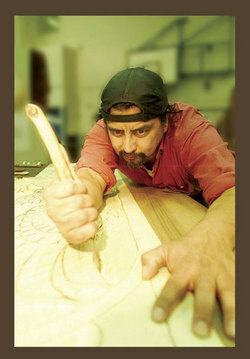 Master Carver Herb Rice carves custom made doors (as in this picture by Andrew Leong), totems, masks, talking sticks, walking sticks, panels and plaques. Collectors from all over the world have bought his pieces. Herb has works in private collections in the Middle East, Australia, and Europe as well as in both North and South America. Herb Rice has done public art pieces for hospitals, universities and cities all around British Columbia. He has had showings in Montreal and New York. Mr. Rice has given lectures at the American Museum of Natural History in New York City and Universities and schools all around North America. Herb offers carving courses twice yearly the last two weekends of March and October, in his studio. They are very popular so early registration is recommended. Check out Herb's website to see examples of his beautiful work and find out more details about his workshops.